TotalWeb Partners Brings Real World Inbound Marketing to US Businesses for a ReasonableCost. Fast, efficient, and comprehensive offers that include strategic guidance, detailed tracking, on-going analysis, and on-going updating from TotalWeb’s professional team. TotalWeb’s staff will learn about your business and remain current to create, publish, and optimize unique content maximizing your online business results. No special quoting is required as costing is quick and easy with TotalWeb’s menu driven services. 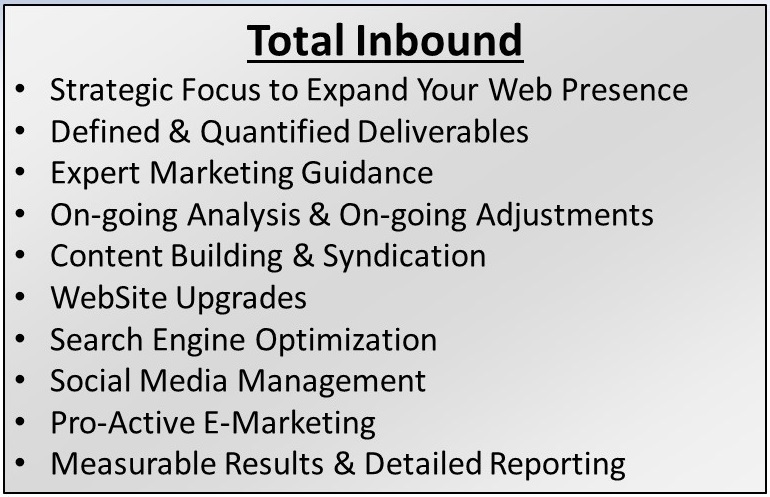 Total Inbound Marketing – Integrated and comprehensive full service online marketing strategies. * Excludes Configurator. If product configuration is required click here for TotalWeb Partners Advanced Catalog Solutions. Design & Build packages. Includes Graphic Design, Copywriting, On-going updating, interactive pages, mobile & RWD, and E-commerce modules. Comprehensive national & regional packages. Includes Keyword Research, Keyword & Meta Data Optimization (on & off site), blogging, and unique content creation. Comprehensive national & Regional packages. Includes profile development, posting creation, blogging, content optimization, and community building. Comprehensive proactive E-newsletter marketing. Packages include list management and building, newsletter copywriting and publishing, and site integration. Quality improvements for quality sites. Modules available for; additional pages, copywriting, interactive galleries, RWD & mobile, E-commerce, and more.